The smokybrown cockroach is closely related to the American cockroach. The distinguishing detail that separates the two is the smokybrowns dark mahogany color. The smokybrown has wings which measure 1¼-1½ inch long. Their antennas are also as long, and sometimes longer, than their bodies. The smokybrown cockroach is found in warm and moist environments. Smokybrown cockroaches generally dwell outside, in shady areas such as woodpiles, sewer openings, gutters and leaf piles. When these cockroaches are infested inside residential homes, they are commonly found behind kitchen cabinets, inside pluming areas and inside fireplaces. Smokybrown cockroaches take approximately 28 days to hatch out of the eggs. Eggs are deposited in protected egg cases containing 30-40 eggs. The egg case is brown and approximately 8 mm long. Nymphs do not resemble adult smokybrown cockroaches. They are small, dark brown to black and do not have wings. At room temperature, the nymphs mature in approximately 60 days. The adult stage is complete in 3-23 months, depending on the environment. Adult smokybrown cockroaches have a lifespan of approximately 6-10 months. The smokybrown cockroach is a scavenger and feeds off a wide range of organic matter. The smokybrown cockroach prefers moist environments and tends to eat decaying organic matter. 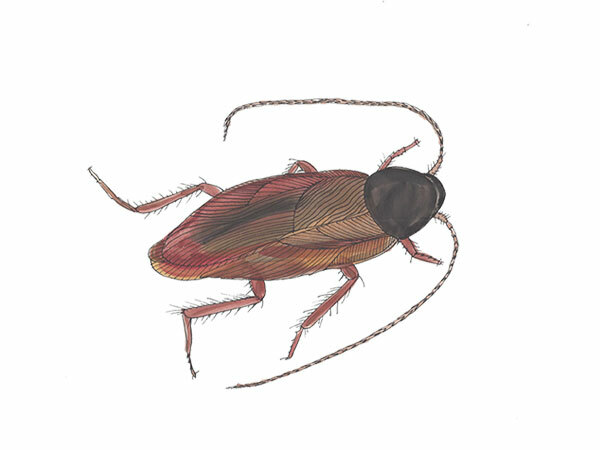 Once inside a residential home, the smokybrown cockroach can contaminate food and cause severe allergic reactions. They are known to carry diseases such as salmonella typhimurim, entamoeba histolytica and plioyelitis. Smoky brown cockroaches spend the majority of their time outdoors. However, once infested inside, smokybrown cockroaches can be seen near areas with high moisture content. Smokybrown cockroaches are most active at night and gain entry into homes through slight openings such as roof gaps and crawl spaces. Over the course of their life, female smokybrown cockroaches will lay around 17 egg cases. Each egg case will contain around 25 eggs. Egg cases are generally deposited in areas with food and water. Feces resemble black pepper and can be found in areas where smokybrown cockroaches are trafficking the most. Fix water leaks. Smokybrown cockroaches loose moisture rapidly and require a constant source of water. Keep attic and crawl space well ventilated. Frequently clean house gutters. Smokybrown cockroaches like wet leaves and organic debris. Trim trees or shrubs that are touching the home. Discard all cardboard boxes. Smokybrown cockroaches like to dwell in cardboard boxes. Fasten tight fitting lids on all garbage cans inside and outside the home. Refrain from filling animal bowls to unnecessary levels. Eliminate leaf piles, lawn clippings and debris from the exterior of the home. Caulk and repair openings the size of a penny or larger. Cockroaches can flatten their bodies and squeeze through incredibly small openings. Keep mesh screens tightly fastened on all windows, doors, and vents. Attach door sweeps when large gaps are present at the bottom of doors. Outside the home, treat the perimeter, entry points and areas where moisture builds up. Inside the home, treat baseboards, cracks and crevices. Apply residual insecticide around all plumbing areas and vents. Cockroach baits contain insecticide mixed with food attractants to entice cockroaches. Baits are available in granules, dusts and gels. Check the bait regularly to review its effectiveness. Try switching to a different bait if the cockroaches stop taking the original bait. Make sure the bait is out of reach to children and pets. We have been getting rid of roaches in home since 1934. We serve Bradenton cockroach control, Lakewood Ranch cockroach control, Ellenton cockroach control, Bradenton Beach cockroach control, Parrish cockroach control and surrounding areas. Call us today to solve your cockroach problem. Cloud Termite and Pest Control services Anna Maria cockroach control, Palmetto cockroach control, Holmes Beach cockroach control and surrounding areas.